Erica called me a slacker yesterday. What's up with that? Monday I spent all day traveling with my kiddos alone. That's a tough thing to navigate airports towing two kids. They did great though. Anyway, yesterday was spent recovering and spending time with my hubby who is on Spring break. Yay! We are so glad to have him back. It's been nice. Anyway, so I'm back in Missouri and ready to resume life again. This is my first digi page this month. I can't believe we are mid March already? Time flies, and speaking of...my lil' girlie turns five next month and I've been thinking a lot about that. It's crazy. *Sigh* So my layout this week is my thoughts on my girlie growing up. This kit is by the Queen of Quirk. You can find it here and here. So I've been teasing you with a giveaway for about a week. It's a great one and whether you like to digi scrap, showoff your photography, or make a gift for a family member you will love this! 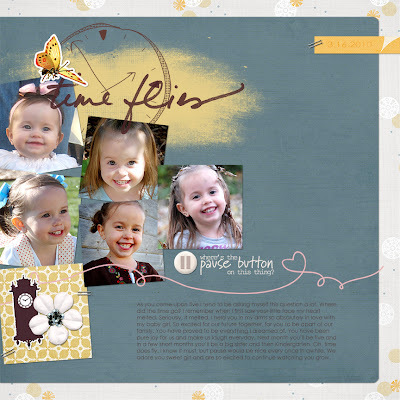 I have a FREE﻿ 20 page 8x8 Shutterfly Photo Book to giveaway. This is a $20.00 value. Not bad, right? These are a great way to get your pictures from your hard drive into a book you can handle and show off! I've done a few books by Shutterfly and have been impressed with all of them. Check out some samples here. Okay, to enter in our drawing you can do three things. You need to comment for each thing you do to count as an entry. Also, if you refer someone AND they become a follower we'll give you an extra entry. Sound good?! Yay! I will pick a winner next Wednesday morning. You have until midnight Tuesday. Good luck!!! Oh, and I just wanted to thank one of my besties and the culprit that got me hooked on digi scrapping, Rachael for donating this giveaway. She is a Gallery Guru over at Shutterfly. She's so cool! I linked my facebook to your blog. You are NOT a slacker. But I am. I didn't even get to see you! Bummer. I like you both on fb and in real life. And I linked you on fb. Now pick me!!! Thanks for the shout-out!! You rock...I miss you so much!! I've got you guys linked on my blog, I guess that counts right? And I'm a follower!! Because you guys are awesome!